I love the vision of a swimming elephant. If you saw the Fall, you would have seen that amazing scene in which the elephant comes to save the bandits off the island. I think it the most beautiful sight ever, a swimming elephant. How about a suspended one, that is balancing off of her trunk? 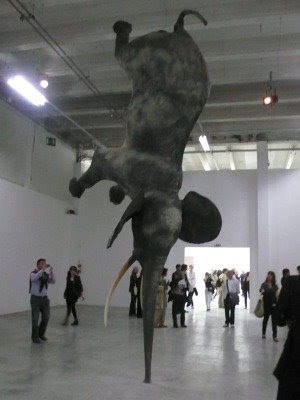 Daniel Firman 's show in Paris last summer includes this beautiful vision of a taxidermy elephant. I don't think I could have contained myself if I was in the presence of such a magical creature. 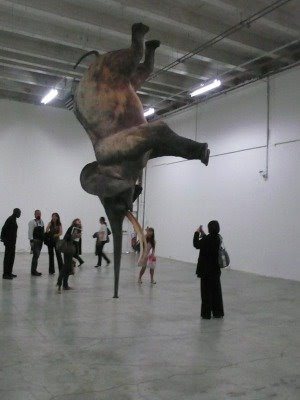 At a distance f 18,000 km from the earth, the elephant Wursa could balance on her trunk. It is on the basis of learned scientific calculations that Daniel Firman reached this conclusion, and came above all to produce this extraordinary work which confounds all our certainties regarding the gravitation of bodies. 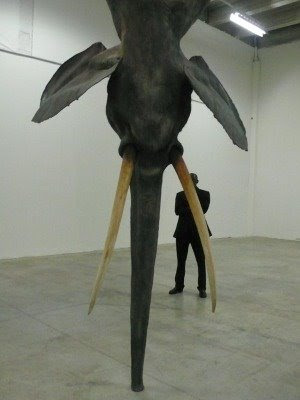 The life size creature's precarious equilibrium seems to put us in danger. The hyper-realist sculpture borrows from the skills of a taxidermist which gives us the opportunity to seesaw between a proven scientific phenomenon and the real and physical putting of the world into perspective. Wursa, conjures up a Russian Sputnik and the conquest of space, is fixed in her position as if one of her acrobatic feats had been arrested by the pause button: this vision enables the artist to offer a novel physical and psychological experience.